New College Choir has revived a 16th century Oxford custom. For the first time in 400 years, the choristers performed at a special ceremony at Bartlemas Chapel in Cowley. The site was a popular destination for pilgrims from the 14th Century, but after the Reformation the pensioners of Bartlemas were left destitute. 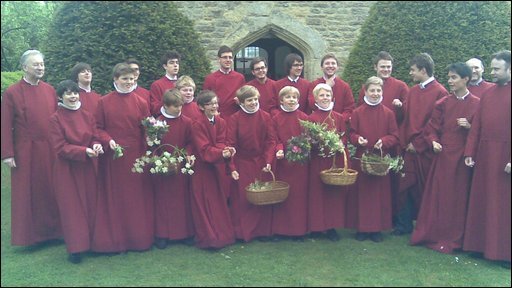 The New College choristers started to raise money for them by walking to the chapel on Ascension Day to sing, but the tradition died out. Now on Ascension Day 400 years later, the choir has followed in the footsteps of its ancestors. After the service, members proceeded towards Oriel College's playing field, singing madrigals around the site of an ancient spring. Jane Harrison, Project Officer for the East Oxford Archaeological Project, said: "It is very exciting that New College is experimenting with bringing back this wonderful historical tradition. "The closure of Magdalen bridge on May Day means those living in east Oxford feel excluded from the city's celebrations. "This is something special for our community. "